Dynaudio introduces the new Confidence C1, the first compact loudspeaker in the innovative, high-performance Confidence series. The technology is based on the development of the Confidence C2 and C4 models, integrated into a two-way design with a clear-cut but individually contoured shape. The C1 was developed to be used both as a two-channel stereo speaker as well as a main, side or rear channel speaker in a surround set-up in the Confidence performance level. The C1 base plinth is designed with integrated mounting holes to accommodate the new Dynaudio StandÂ², a solid and aesthetically suitable base for the loudspeaker. The C1 may also be placed on bookshelves or into A/V cabinetry if necessary. Absolutely beautiful sound. Open, transparent, sparkling, detailed. Superb integration between woofer and esotar² tweeter with a first order crossover. Incredible bass for such a small speaker. Has great presence. A delightful speaker. Aesthetics not for all tastes (they're grown on me). As others have written, 4 ohm load requires decent amplification. These babies have been in the system for about 5 years, and I just can't seem to part with them. Others have noted that Dynaudio speakers need power. They are being fed the "all you can eat" buffet with a Pass Labs X250.5 Class A A/B amp. It's nice to have a little bit of Class A with the muscle of 500 watts into 4 ohms behind it. CD is the source with a tube pre amp. The speaker stands have been filled with sand and lead shot. There is a REL sub to take care of the lowest bass notes. No need to turn the gain level up past 2 as these bookshelves have remarkable bass response on their own. Once set up correctly and all the electronics are warmed up, you are rewarded with a deep, wide, soundstage with excellent tonal balance from top to bottom. I had the Confidence C1's for 6 months now and wow what an experience. I must say the most engaging speaker I've ever had. You must give it the right amplifier, and speaker cables. Bryston and Cardas can do the trick. Beautiful sound very well balanced. After reading all these positive reviews I had to hear a pair of these for myself. I really wanted to like them, I even tried purchasing them twice on audiogon but someone else beat me to it. They sell real fast, another indication that they are desired and should sound great, or should they. I called a dealer and arranged an audition. They did sound good, no doubt, the Mids are clear and natural, The high frequencies are also nice, acceptable, but not as airy and refined as the Dynaudio Esotar T330D drivers which I have heard on the Egglestone Works Andrea, also available on the Dynaudio Confidence C3 and C5 which are currently discontinued. They wanted $6000 for a pair, can you repeat that, $6000 for these tiny boxes? Where did the C1's fail heavily? In the bass area, none at all, flat and boring. The room was about 18 x 18 and had good equipment. I have a pair of Polk audio LSI9's at home and they can produce deep bass and smooth, airy, highs, they probably cannot compete with the C1's in the Mid-range territory but I never had the chance to do a side by side, they also cost 12 times less. Don't get me wrong the C1's sound fabulous for those who love vocals, piano, violin, anything without deep bass, soft music, maybe some jazz. I think it's an insult to charge $6000 for a pair of speakers that cannot go clean into the 30/35 hertz area. Now just next to the C1's was a pair of Wilson Sophia II, for about $3000 more you get ten times the speaker of any Dynaudio Confidence speaker. Simply put I have never heard a finer speaker than Wilson Watt. Only one channel was working on the Sophia but that one single channel sounded better than both channels on the C1. I was taken to the next room where a larger Wilson Audio Sasha stood and I listened carefully to that pair. One audition on the Wilson's and I never wanted to hear the C1's after that. I know there is a big price difference but Wilson's sound signature is in another category on all their models, even the less expensive ones. Considering there might have been a slight possibility that the C1's were not set up properly (I highly doubt it) I am still open to trying a pair at my home with my equipment to finally conclude these are over hyped speakers at a great cost. Just replaced my Dynaudio Special 25's with the Cofidence C1's last week. I loved the 25's but the Confidence C1's are overall a superior speaker. They are amazing on vocals and inner detail within the soundstage. The overall conherence is better than the 25's. They may be best monitor in the world or in the discussion. You need watts to drives these units, more than the 25's. The better the equipmnet the better these babies work. Best in class product. Very realistic with amazing bass. Needs a very good and powerful amplifier. High price but value for money is optimised. There is a long time I should have written this review. I changed my 15-years-old speakers, a pair of Equation 1B standfloor one year ago for a pair of brand new Dynaudio C1 monitors. The speakers at that time were showing good qualities but the amplification stage of my system was not strong enough to drive them properly. I knew that from the beginning but I could not afford a balanced system in one shot. 2 month ago I changed my Thule IA60B SE for an integrated Plinius 9200 amplifier. I must say that the combo works perfectly and enables the C1 to deliver very high musical results. Before starting the audition, let me describe the whole context. My room is quite small : 4x5 meters, opened on a bigger one, which explains my choice of bookshelf monitors rather than big standfloor ones. I located the monitors on Dynaudio stands with the back at one meter far from the rear wall. As I said previously the amplifier is a Plinius 9200, totally transparent and powerful (2w300W / 4Ohms). The CD player is the weakest piece of the chain, but does not work so bad. It is a Thule CD150B upgraded with the 192Khz/24bit Digit II converter. An AudioQuest Cobra interconnects the source to the amplifier in symmetric mode. The C1 are linked to the Plinius by AudioQuest Crystal cables. The image is impressively wide, with sounds rising sometimes far away from the right or the left boxes and with plans coming from behind the loudspeakers. Close your eyes, the band is just there, you can’t guess the speakers location. The sound is very clear, very detailed and very realistic. You just listen to music and not to an Hifi system. The frequency-range is very large and flat. At the condition there is some recorded on the CD, bass is incredibly reproduced with very deep, fast and powered response. Totally amazing with such small monitors ! To me, the C1 is a top of art product which offers to a music lover all what he can expect from loudspeakers. Well driven, with a Plinius 9200 for instance, it is simply wonderful. I look forward to changing my CD player in order get the best the system can deliver. I apologise for my lack of precision when describing how the C1 sounds, but I am French and my Ear to English converter does not meet the high-end standard that the C1 would have deserved ! So far, so good. No need of any ! Needs a very good and powerful amplifier. High price but value for money is optimised. There is a long time I should have written this review. I changed my 15-years-old speakers, a pair of Equation 1B standfloor one year ago for a pair of brand new Dynaudio Confidence C1 monitors. The speakers at that time were showing good qualities but the amplification stage of my system was not strong enough to drive them properly. I knew that from the beginning but I could not afford a balanced system in one shot. 2 month ago I changed my Thule IA60B SE for an integrated Plinius 9200 amplifier. I must say that the combo works perfectly and enables the C1 to deliver very high musical results. I apologise for lack of precision when describing how the C1 sounds, but I am French and my Ear to English converter does not meet the high-end standard that the C1 would have deserved ! So far, so good... I have no need of it. Good in upper mids and high frecuencies:Clean high frecuencies, beautyful upper mids, good bass. Voices are clear, a little brilliant. very good with vocals, jazz and litlle orchestras. Complex orchestral soud are not for this loudspeaker. Too much expensive. Sorry for my poor english. I had the chance to hear this loudspeaker with a few amps. I must say that its sensibility demands strong amplifiers. I heard it with 15 w/c singled-ended tube amp: a desaster. The amp cannot drive the loudspeakers. Later, with an hibrid 150 w/c amp and the loudspeaker sound very well. Later with an 25w/c push-pull tube amp: enough to drive the loudspeaker but i recommend more watt (at least 50 w/c in pure class A). At least,a Classe amp in class AB, more than 200 w/c. I must say that complex orchestral sound are uncomfortable for this loudspeaker, in special in low mids and bass; not clear. Wide soundstage. Extremely Smooth and detail highs, without any brightness. The mid-range is this speakers strongest attribute. I went in the store to add a mcintosh pre-amp to my great system. But to my wonder when the sales person used the bookself for my audition, I was simply amazed. 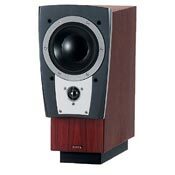 I just purchased a Sonus Faber Grand piano home speakers. But after listening to these i had to have them. The sound stage is wide, the tonal balance is the best i have ever heard. The base was far superior than my floor speakers. Though slightly pricey and aesthetically challenging for some – the Dynaudio Confidence C1’s ability to sing and perform, will instantly draw you into the music won’t let you go. The very long running debate of ‘compact 2-ways vs. larger multi-driver solutions’ will not be solved in this brief write-up, but in the meanwhile; for those of you more interested in raising the level of musical realism within your home -- the C1’s will certainly deliver. Of all the compact sized monitors I’ve auditioned or owned the Dynaudio Confidence C1 is without peer. The strength’s of this model outshine the Dyn 1.3SE, S25, C3, and S3.4. Certainly and without doubt – this is Dynaudio’s Reference model for compact loudspeaker design (past and present). Within the context of my Plinius and Transparent Ultra cabling, the C1’s strengths incorporate a very large soundstage without ever being in-your-face, and is delivers exceptional musical resolution from high 30hz on up . This small 2-way design produces musical realism and resolution on-par with larger and more expensive floor-standing solutions. Further, it’s meaningful bass quality; can and will outshine the deeper reach of many other full sized loudspeaker alternatives; The Dynaudio Confidence line of product is indeed an upgrade from the Contour line of product. Though the Contour line is impressive at it’s respective price-point, the performance envelope of the Confidence models proves easily to be a sonic and more importantly; a musical upgrade. The C1 has got to be the biggest bang for the buck model of the Confidence products, as it is not just a simple small 2-way, instead, it is a completely whole and believable singer. No other Dynaudio product that I have heard (except for the Evidence Temptation model) has successfully re-created the mid-range purity and wholeness like the C1's. (note: the Dyn C2 and Dyn S3.4 are also excellent in the mid-range arena). What I find most compelling about the C1 is that it’s physical size and dimensions would indicate that this level of performance would be seemingly impossible. There is a weight to the sound, that is never over-ripe or bloated -- only exceptionally clear. The contrast in performance as compared to the Special25 is really unbelievable; whether it be on any 2-channel music or dvd film. If you have the chance to audition a C1 you’ll be more than surprised. Again, it's important for you to 'get' that the quality of the C1's presentation really eclipses both the S25 as well as the S3.4 in many significant areas, including and specifically the quality of the mid range and bass. Driver integration is flawless. Also, the size and realism of the soundstage, the decay of instrument notes, the timbre and textures of the music, and overall the voicing of the C1 is full and rich without ever coming through as being veiled or flat. If you get anything from reading this write-up this is it: The C1 is one of the most consistently musically-realistic sounding loudspeakers I've ever heard. Driver arrangement is the inverted style; with the larger driver positioned above the smaller driver, that has proven to be a successful orientation for the upper echelon line of Dynaudio products in the past and present.